Walk Tall with Kundalini Yoga by Nirvair Singh Khalsa contains a wonderful kriya to help balance the lower back and hips. You will walk tall and move forward in your life on all levels - physical, mental, emotional and spiritual. Time-honored practice of stretching, strengthening and healing. 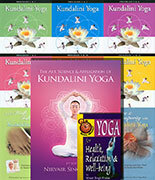 Invigorating, safe and effective Kundalini Yoga and Meditation, appropriate for both beginning and more advanced students. Modifications for students with special conditions. Uplifiting and healing mantra/music by Snatam Kaur from her beautiful CD "Shanti". Quality guidance from a university-level instructor, and demonstrations by a lifelong yoga practitioner.